Though the total of 6W does sound disappointing for a speaker the size of a small water bottle, it does a good job of putting out some rich sound. There is somewhat a lack of bass for those who take their music very seriously, even though the manufacture claims it has a frequency response as low as 80Hz (all the way up to 20kHz). However, the less power-hungry audio drivers coupled with a generous 1400mAh battery do deliver the claimed eight-hour battery life. That swiftly brings us on to portability. Though it’s the size of a 750ml water bottle and rules out any chances of fitting in your pocket, it comes with a carry case and is easily transported in a bag. Weighing less than a third of a kilogram, it is barely noticeable to carry too. 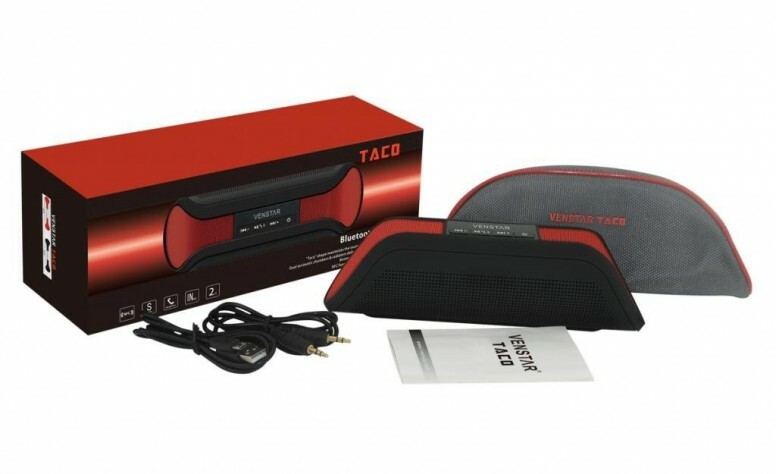 The Taco shape of the Venstar TACO CSR Bluetooth speaker is designed to maximise the sound quality and energy efficiency. The slanted ends of the speaker tube help spread the sound and create a more immersive and fulfilling experience. Since the speaker features three of the most popular connectivity methods, users will have no problems using it with their preferred media devices. NFC, Bluetooth 4.0 and AUX-in are all easily accessible and built in to the Venstar TACO CSR Bluetooth speaker. The only feature missing here is USB, however you are unlikely to find USB connectivity in any speaker at this price-point.